Pat Van Dyke - Hello, Summer is out now! Added on June 23, 2018 by Brian Coulombe. Hello, Summer is the 3rd full length LP from the talented drummer/producer/composer/band leader. Available now on vinyl (clear "pool blue" wax), digital and all streaming platforms. Announcing: Pat Van Dyke album details and first single! Added on June 4, 2018 by Brian Coulombe. We're over the top thrilled to once again work with the oh so very talented Pat Van Dyke. Hello, Summer is his beautiful new album out 6/22 on Cotter Records / Stereo Vision Recordings. Lotus is the lead single and is now available on all streaming + digital platforms. Pre-order the album via Bandcamp (vinyl + digital) or Fatbeats (vinyl). Added on April 16, 2018 by Brian Coulombe. Added on December 22, 2017 by Brian Coulombe. We're thrilled to play a small part in the release of this incredible album. Embracing a recording environment that usually involves sitting on the floor in a dark room, the Dirty Art Club production style is anchored around the technique of creating a sonic texture based on multiple sources: The fruits of vinyl digging trips are combined with layers of live instrumentation and embellished with field recordings and atmospheric effects. These component parts are skillfully mixed so that they “sound like one sample.” It’s a trick that creates a unity of sound where songs segue together while moving the emotional narrative along. Pre-order the 2xLP on clear vinyl over at Fat Beats. Out 2/16/2018. Added on March 29, 2014 by Brian Coulombe. So thrilled to have the Village Voice feature us and our latest release. Bobbito Garcia, the New York DJ and streetball legend, doesn't like the playlist on his East Village Radio show to be predictable. "I kind of pride myself on the fact that you can never guess what I'm going to play," he says during a recent phone interview. So how then does Garcia account for the fact that for three consecutive weeks on his show in February and March, he set things off with the same exact record, a jazz cut from an album called Technicolor Hi-Fi by the drummer, bandleader and producer Pat Van Dyke? There's certainly no personal connection. "I don't know Pat from a can of paint," Garcia says. "But what I perceive the PVD record to be is a jazz record that's probably produced by someone young enough to be raised on hip-hop." "There's records that scream at you to play them," he adds. "The PVD record just kind of yells, 'Yo, play me.'" Added on February 8, 2014 by Brian Coulombe. Added on January 4, 2014 by Brian Coulombe. Huge thanks to all who came out! And a big congrats to PVD on the new record! Added on November 24, 2013 by Brian Coulombe. Take a look behind the scenes and hear two choice cuts from the album. 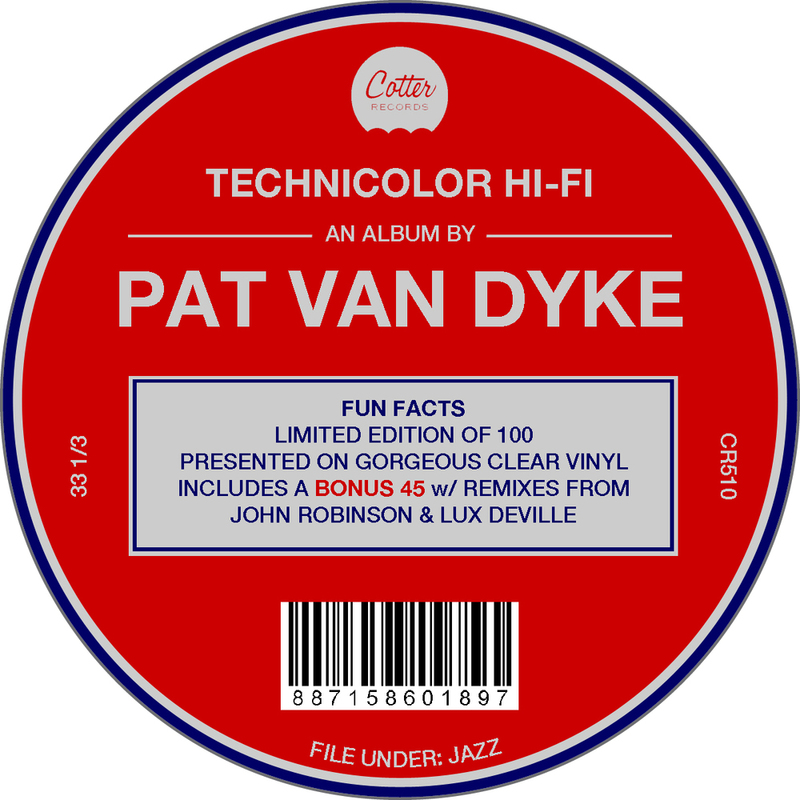 Pat Van Dyke's album Technicolor HI-FI is out 12/10 on vinyl LP (with bonus 45) and digitally. Added on November 3, 2013 by Brian Coulombe. Set for release on 12/10/13, you can pre-order the Vinyl LP (w/ Bonus 45) HERE. Limited-Edition of 100 and presented on clear vinyl. Bonus 45 features two exclusive remixes by John Robinson & Lux Deville. Added on October 13, 2013 by Brian Coulombe. Look for this one coming your way in early December 2013! Sticker for the LP jacket below. Added on May 9, 2013 by Brian Coulombe. Added on October 9, 2012 by Brian Coulombe. Hip Hop veteran John Robinson & PVD have been rocking crowds together at such venues as The Blue Note, NJPAC, & Southpaw for over 3 years. J.R., a veteran of the underground Hip Hop scene has recorded with MF Doom, Danger Mouse, J.Rawls, Scienz of Life, Flying Lotus & many more. PVD's jazz influenced breaks & Robinson's intelligent wordplay have been quickly gaining the respect of audiences young and old. This release sees the duo putting their talents to wax on a limited edition 45. Both tracks are sure to be praised by true-school hip hoppers and jazz fans alike, not to mention those who appreciate quality, heartfelt music of any genre. The slick, up-tempo "Miles & Trane" leads the way – doing more than just paying homage to two of the greats. On the flip is "Kiss The Sky", which sees JR speaking on what is important ("Who's your inspiration? Who's influential in your life? Have you reflected lately? Kiss your children and your wife") backed with the lovely vocals of Melinda Camille. Enjoy this 45.